Modify the properties to reflect that the given parton which was previously extracted is removed. Returns true if and only if this particle has decayed. The list of decay products. Add a child (the childs parent pointer will be set accordingly). Remove the given child from the list of children of this particle (the corresponding parent pointer of the child will also be removed). The list of parent particles. Undo the decay of this particle, removing all children (and grand children ...) from the event record. If this particle has decayed set the corresponding decay mode. If this particle has decayed get the corresponding decay mode. Get the first Step object where this particle occurred. Get the order-number for this particle in the current event. Access the ParticleData object of this particle type. Return the PDG name of this particle. Return the PDG id number of this particle. Return the momentum of this particle. Set the momentum and mass. Acces the mass of this particle. Acces the mass of this particle type. Get the scale at which this particle is considered resolved. Set the scale at which this particle is considered resolved. Get the scale above which this particle should not radiate. Set the scale above which this particle should not radiate. Return the transverse mass (squared), calculated from the energy and the longitudinal momentum. Return the transverse mass (squared), calculated from the mass and the transverse momentum. Return the positive and negative light-cone momenta. Set the creation vertex relative to the collision vertex. Set the creation vertex in the lab frame of this particle. Set the life time/length of a particle. The invariant life time of this particle. Do Lorentz transformations on this particle. Rotate around the given axis. Do Lorentz transformations on this particle and its decendants. Rotate this particle and its decendants around the x-axis. Rotate this particle and its decendants around the y-axis. Rotate this particle and its decendants around the z-axis. Rotate this particle and its decendants around the given axis. Return the relative inconsistency in the mass component. Return the relative inconsistency in the energy component. Return the relative inconsistency in the spatial components. Rescale energy, so that the invariant length/mass of the LorentzVector agrees with the current one. Rescale spatial component, so that the invariant length/mass of the LorentzVector agrees with the current one. Set the invariant length/mass member, so that it agrees with the invariant length/mass of the LorentzVector. Return the colour lines to which this particles anti-colour is connected. Return the colour lines to which this particles (anti-)colour is connected. Return true if the particle is connected to the given (anti-) colour line. Return true if the particle is connected to the given anti-colour line. True if this particle type is not a colour singlet. True if this particle type carries (anti-)colour. True if this particle type carries anti-colour. 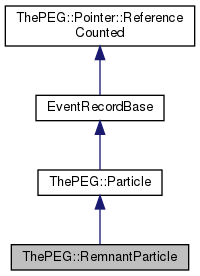 Access user-defined information as a vector of EventInfoBase pointers. True if this particle has instantiated the object with information other than type and momentum. If this particle has only a type and momentum, instantiate the rest of the information. Standard function for writing to a persistent stream. Standard function for reading from a persistent stream. Print a range of particles. Print a container of particles. If necessary, colour-connect this remnant to the given parton. Private default constructor must only be used by the PersistentIStream class via the ClassTraits<RemnantParticle> class. Private default constructor must only be used by the PersistentIStream class via the ClassTraits<Particle> class. The RemnantData object associated to this remnant. The parent from which this remnant resulted. The set of extracted partons. The ClassTraits<RemnantParticle> class must be a friend to be able to use the private default constructor. Here is the documentation of the RemnantParticle class. Definition at line 25 of file RemnantParticle.h. The standard constructor takes as argument the particle for which this is the remnant and a decayer capable of performing the decay. Optionally a parton that has been extracted. Note that if the parton is given, the extraction may silently fail. Modify the properties to reflect that the given parton was extracted. If fixcolour is true a colour line is drawn from the remnant to the extracted parton. Modify the properties to reflect that the previously extracted parton, oldp, was evolved backwards to the the parton newp. Indicates that this is a concrete class with persistent data. Definition at line 147 of file RemnantParticle.h.